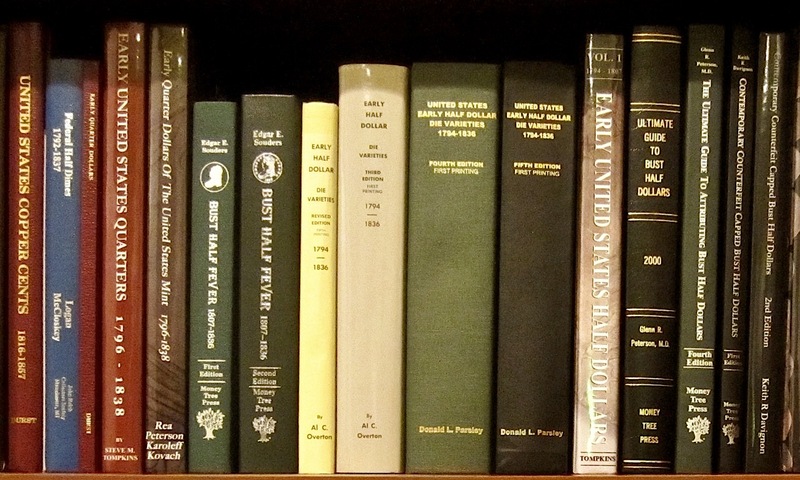 Many JRCS members have written or edited books on their favorite Federal coinage. This site provides links for further information. Please email the Website Administrator to have your entry added, removed, or updated. Metcalf, William E., America’s Silver Coinage, 1794-1891, Coinage of the Americas Conference at The American Numismatic Society, New York, November 1-2, 1986. Hardbound. Out of Print. Newman Numismatic Portal. Logan, Russell J. and McCloskey, John W., Federal Half Dimes 1792-1837, John Reich Collectors Society, 1998. Hardbound. Out of Print. Davis, David J., Logan, Russell J., Lovejoy, Allen F., McCloskey, John W., Subjack, William J., Early United States Dimes 1796-1837, John Reich Collectors Society, 1984. Hardbound. Out of Print. Zack, Winston, Scuderi, Louis, Sherrill, Michael, Bust Dime Variety Identification Guide, 2015. Spiral Bound. Rea, Rory R., Peterson, Glenn, Karoleff, Bradley S., and Kovach Jr., John J., Early Quarter Dollars of the United States Mint, 2010. Rory Rea. Hardbound. Tompkins, Steve M., Early United States Quarters 1796 - 1838, 2008. Hardbound. Tompkins, Steve M., Auction Appearances & Prices Realized for Early United States Quarters 1796 - 1838, Self-published. Softbound. Parsley, Donald L., Early Half Dollar Die Varieties 1794 - 1836, Fifth Edition, 2014. Tompkins, Steve M., Early United States Half Dollars, Volume 1, 1794 - 1807, 2015. Hardbound. Souders, Edgar E., Bust Half Fever 1807-1836, Second Edition, 2006. Money Tree Press, 1260 Smith Court, Rocky River, OH 44116. Peterson, Glenn R., The Ultimate Guide to Attributing Bust Half Dollars, Fifth Edition, 2017. Hardbound. Herrman, Stephen J., Auction & Mail Bid Prices Realized for Bust Half Dollars 1794-1839, Self-published, semi-annually. Softbound. Reiver, Jules, The United States Early Silver Dollars 1794 to 1803, 1999. Abe Books, 700 E. State Street, Iola, WI 54900-0001. Bowers, Q. David, The Encyclopedia of United States Silver Dollars 1794 - 1804, 2013. Stacks-Bowers Galleries. Hardbound. Taraszka, Anthony J., United States Ten Dollar Gold Eagles 1795 - 1804, Anton’s, P.O. Box 2548, Portage, MI 49081. Hardbound. Davignon, Keith R., Contemporary Counterfeit Capped Bust Half Dollars, Second Edition, 2010. Money Tree Press, 1260 Smith Court, Rocky River, OH 44116. Witham, Stewart P., Johann Matthaus Reich, Also known as John Reich, 1994. Softbound. Out of Print. Newman Numismatic Portal.